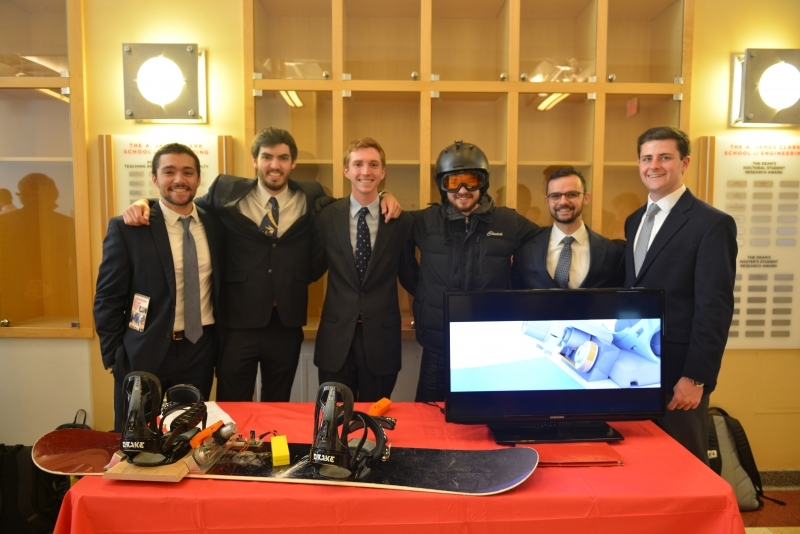 Design Day highlights the talents and creativity of mechanical engineering students in the Integrated Product and Process Development Course. 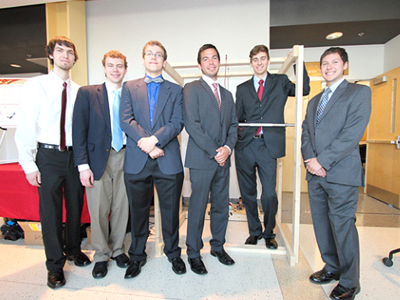 Teams of senior level students present project prototypes built to solve selected engineering problems. 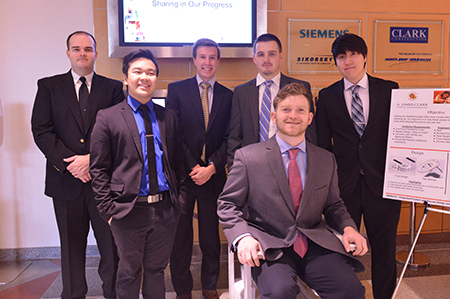 Instead of waiting on solutions to everyday, real-world problems, mechanical engineering students worked together to develop their own. Teams then demonstrated their finished products at Design Day 2018. Design Day attracts a wide audience that includes the campus community, area high school and middle school students, family, friends, and anyone interested in innovation and product design. 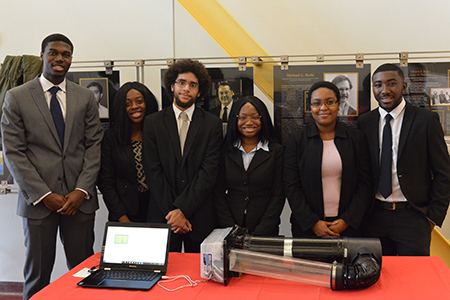 Projects are judged by faculty, students, and industry representatives based on technical criteria. All visitors are encouraged to vote for their favorite project. The team with the majority votes is honored with the "People's Choice Award." 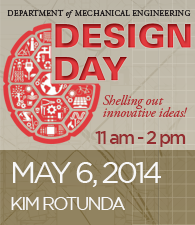 Interested in Supporting Design Day? Become a corporate sponsor or volunteer as a guest judge! 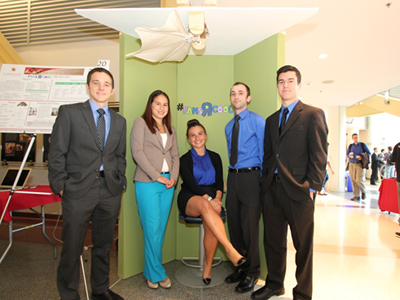 Intralox has been a regular sponsor of Mechanical Engineering's Design Day event. 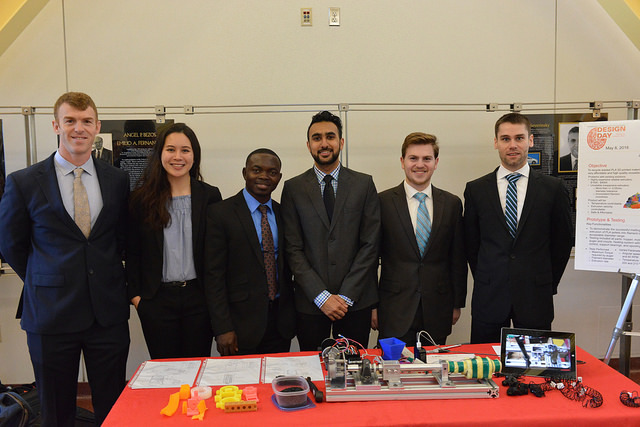 The Department of Mechanical Engineering held the Fall Design Day on December 4, 2018 from 11 a.m. to 2 p.m. in the Kim Engineering Building. 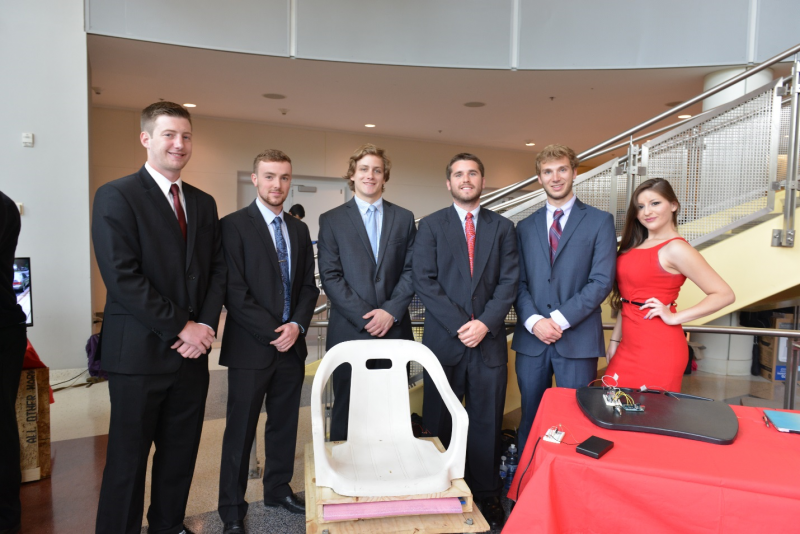 This semester, Design Day showcased 24 student teams, all featuring original product prototype designs built to solve selected engineering problems. There was a wide range of exhibits, from an autonomous system for filling potholes to a storm surge protector for boats. 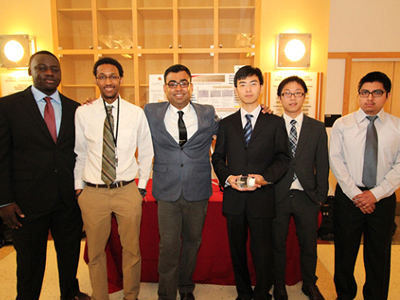 Design Day highlights the talents and creativity of mechanical engineering students in the capstone Integrated Product and Process Development Course. 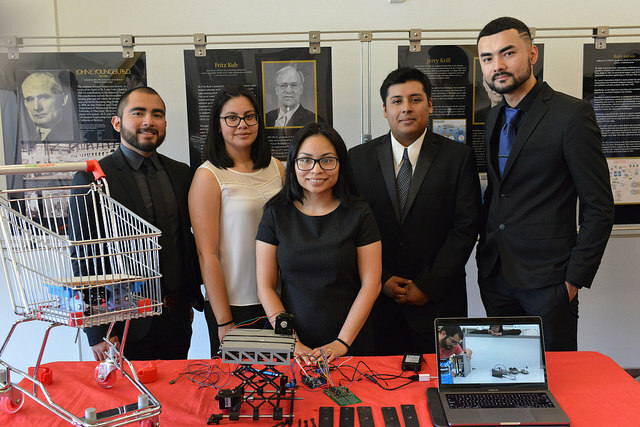 Attendees have the chance to vote for their favorite projects, and the top voted team receives the “People’s Choice Award” and has their names displayed in the Mechanical Engineering undergraduate office. 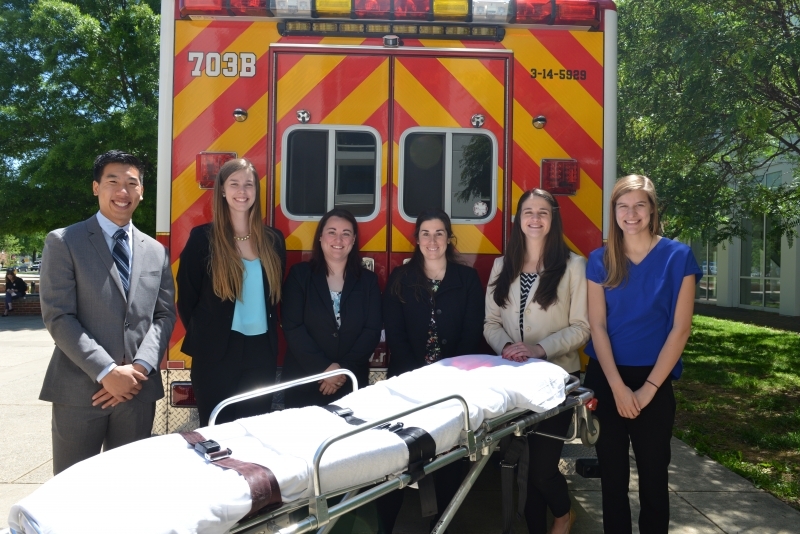 FIRST Place: Paw Patrol (Jessica Brewer, Jennifer Goleman, Kellie Martin, Gray Matty, Sahar Motazedi, and Patrick Talsania) with their project “The Really Awesome Product (T.R.A.P. )", an automatic animal trap with remote notification and interfacing capabilities. 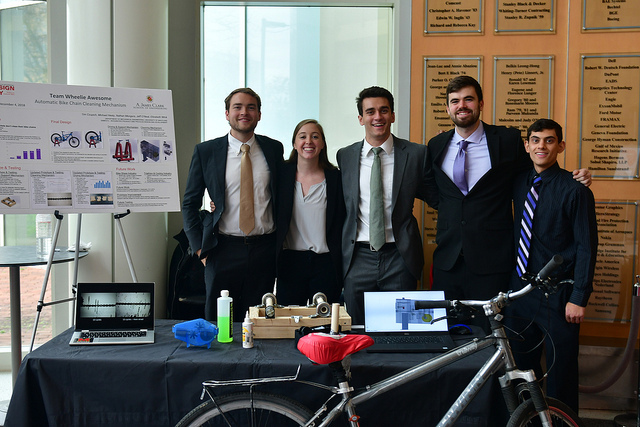 Fall 2018 Social/Environmental Design Impact Award Winners: Team Wheelie Awesome (Tim Czupich, Michael Healy, Nathan Mengers, Jeff O'Neal, and Lizzie Wonk) with their project “The Wheelie Awesome Chain Cleaner”, an automated cleaning mechanism that degreases and lubricates bicycle chains. 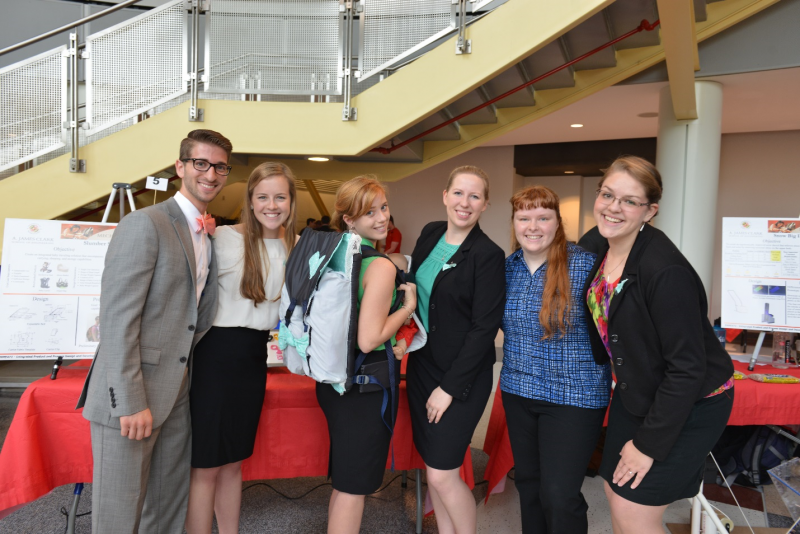 For more photos of the event, check out our Flickr album! The Department of Mechanical Engineering held the Spring Design Day on May 8, 2018 from 11 a.m. to 2 p.m. in the Kim Engineering Building. 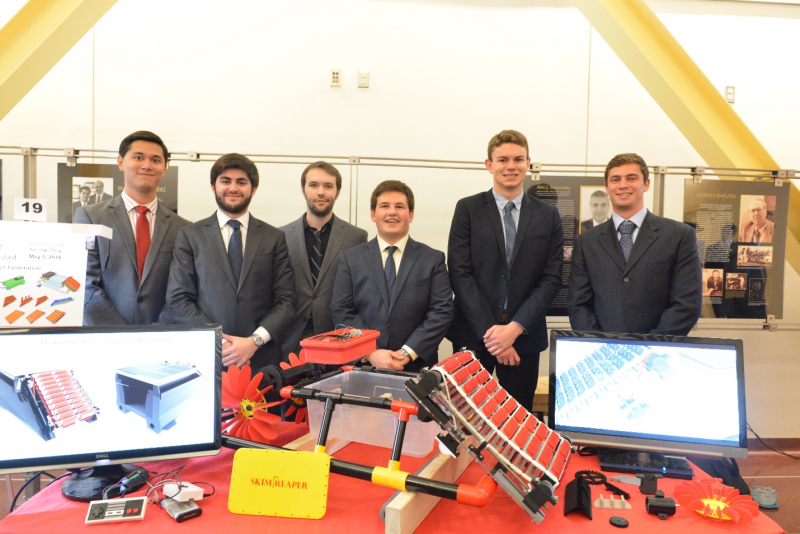 This semester, Design Day showcased 33 student teams, all featuring original product prototype designs built to solve selected engineering problems. There was a wide range of exhibits, from small modular nuclear reactors to alternative power sources for developing nations. FIRST Place: The ReStruders with their product that recycles used PLA, or polylactic acid, and extrudes it into repurposed filament for 3D printing. 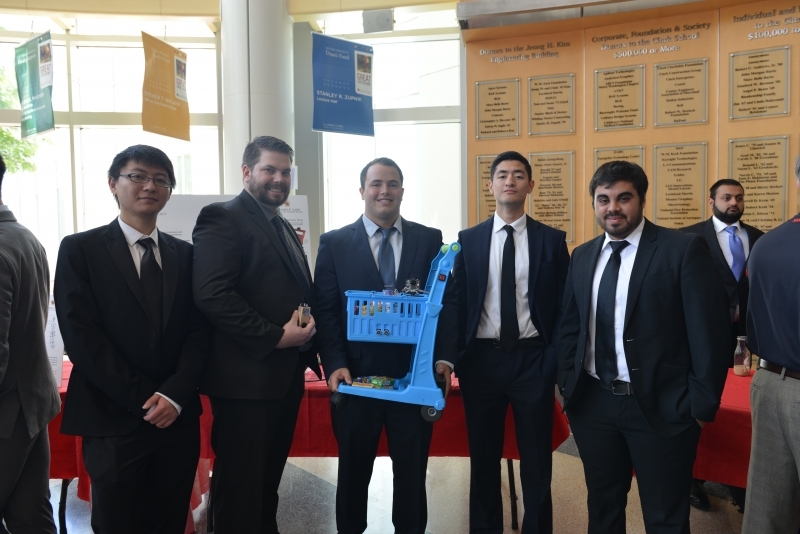 SECOND place: Team UCA with their Universal Cart Assist, which aids individuals lifting heavy or bulky items into and out of their shopping carts. 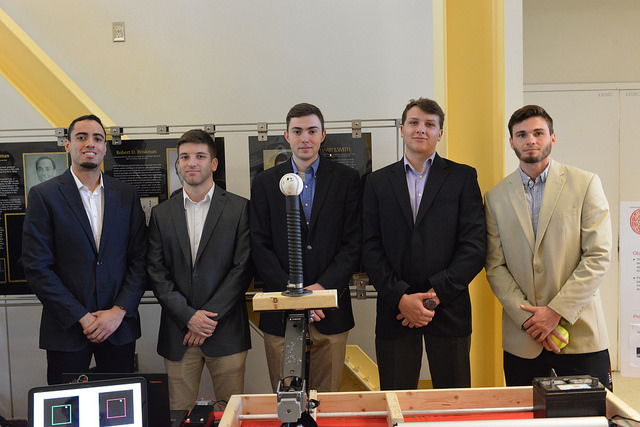 THIRD place: Super Sluggers with their electromechnical batting tee, an all-ages baseball training device that places a baseball in a user-specified strike zone location. 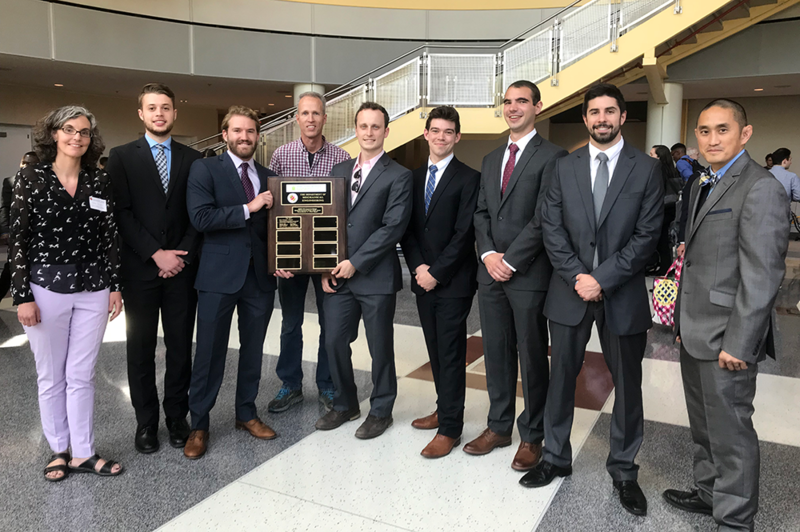 Spring 2018 Social/Environmental Design Impact Award Winners: Oyster Boys (Noah Todd, Kyle Thibeault, Noah Suttner, Chris Buckley, Patrick O'Shea, and Steve Powers). Their product, Bay Watcher, is a beacon prototype capable of listening for the sound of dredging and, upon detecting that specific sound, alerting the necessary authorities to this illegal and destructive practice. The Department of Mechanical Engineering held the Fall Design Day on December 5, 2017 from 11 a.m. to 2 p.m. in the Kim Engineering Building. 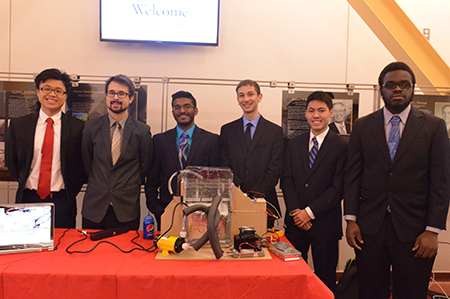 This semester, Design Day showcased 29 student teams, all featuring original product prototype designs built to solve selected engineering problems. There was a wide range of exhibits, from an umbrella that resists inversion through a truss-inspired design to an assistive cane that ifts small household objects. Sponsors Intralox and Boeing helped the support the day's festivities. 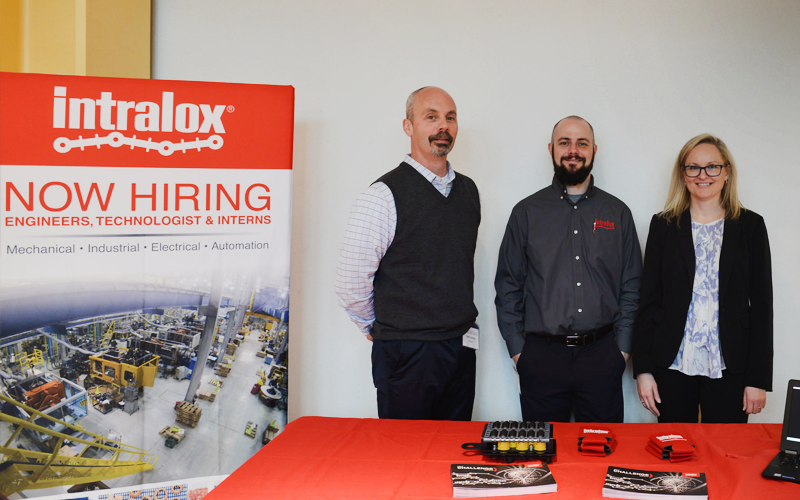 Intralox employees Matthew Fourney, Andrew Akers and Jeff Schwai attended as judges to offer their technical expertise and feedback to students. STEM students from the Old Mill Middle School South, Baltimore Polytechnic Institute and McKinley Technology High School were also in attendance. 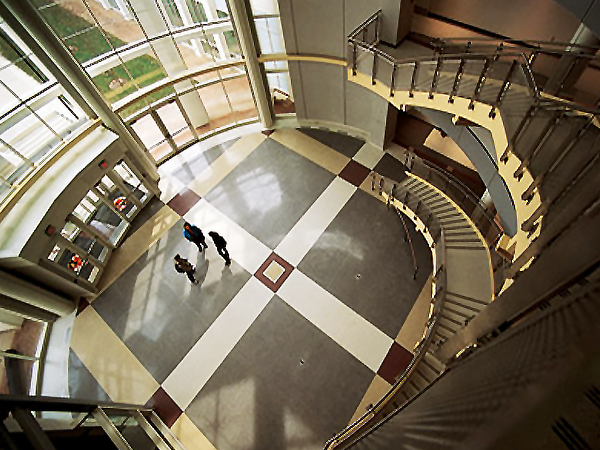 Starting this semester, Design Day will offer a new award, the “Social/Environmental Design Impact Award,” funded through the Office of Sustainability and the Department of Mechanical Engineering. These projects are judged on the social or environmental impact considerations that teams have incorporated into their designs. Judges come from the Office of Sustainability. 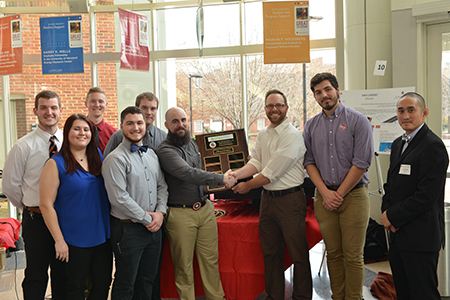 Each semester’s winners will receive recognition on a plaque to be displayed in the Mechanical Engineering hallway and a $100 donation towards a fund of their choosing. Fall 2017 Social/Environmental Design Impact Award Winners: Team Save Chessie! 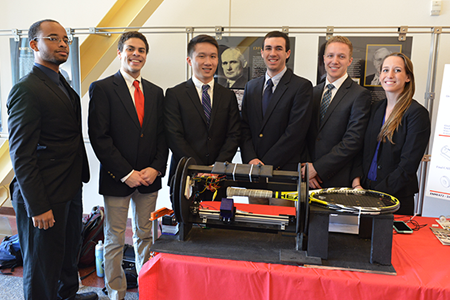 (Zachary Ball, Eric Bazyk, Andrew Graham, Mike Johnson, Sean Thomas and Mariya Tymofiy) with their project “Chessie.” Chessie is a solar-powered, floating aerator that can be used to revive oxygen deficient zones in large bodies of water. The Department of Mechanical Engineering held the Spring Design Day on May 9, 2017 from 11 a.m. to 2 p.m. in the Kim Engineering Building. 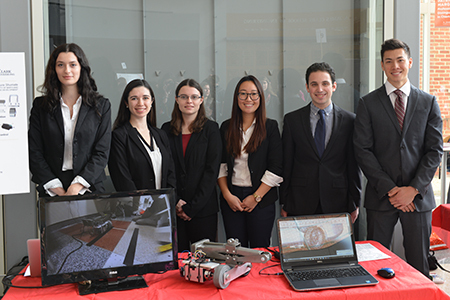 This semester, Design Day showcased 31 student teams, all featuring original product prototype designs built to solve selected engineering problems. There was a wide range of exhibits, everything from a horse jump standard that resets a fallen pole to a system that opens and closes windows based on current weather conditions. Sponsors Bell Helicopter helped the support the day's festivities. Bell Helicopter employee and Mechanical Engineering Visiting Committee member Charley Kilmain offered some words of encouragement and kicked off the event. 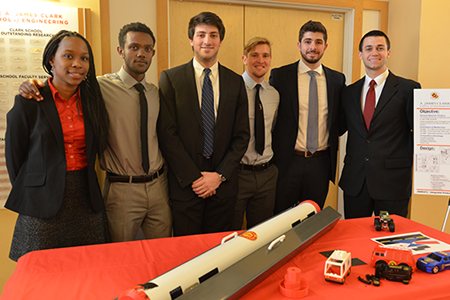 Design Day highlights the talents and creativity of mechanical engineering students in the capstone Integrated Product and Process Development Course. 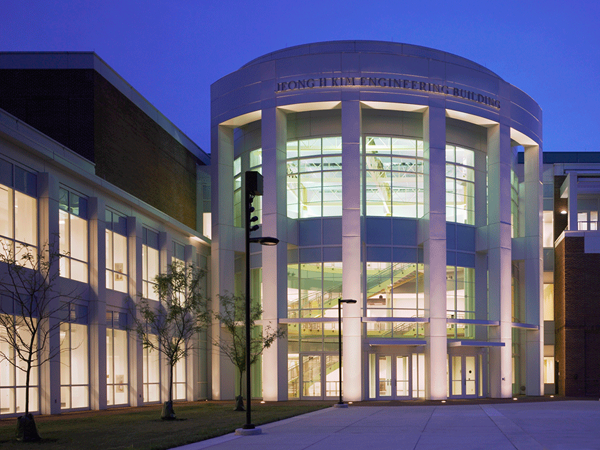 In addition, the event offers an opportunity for regional high school students to visit the campus and experience firsthand what pursuing a degree in mechanical engineering is all about. 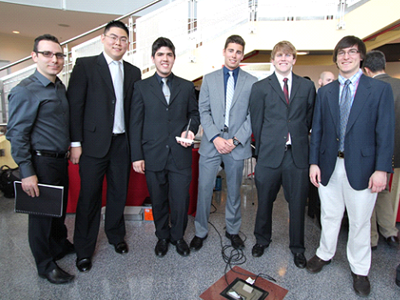 THIRD place (a tie): Team Fair Gates (Caleb Cook, Ahmed Hamoud, James Keenan, Grace Lin, Eric Mayo, Ryan Umagat) with their project "Double Door"
Team Spin to Win (Jaime Berez, Ryan Blum, Conor Briggi, Andrew Fein, Chase Manny, Andrew Montgomery) with their project "Hands-Free Snowboard Binding"
The Department of Mechanical Engineering held the Fall Design Day on December 6, 2016 from 11 a.m. to 2 p.m. in the Kim Engineering Building. 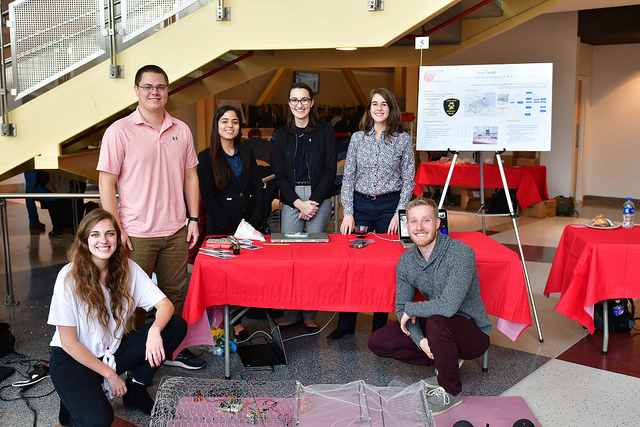 This semester, Design Day showcased 29 student teams, all featuring original product prototype designs built to solve selected engineering problems. There was a wide range of exhibits, everything from an actively cooled bicycle saddle to a fully automated fish acclimation device. Sponsors Intralox and Boeing helped the support the day's festivities, Intralox employee Andy Akers kicked off the event, and along with colleague Matthew Fourney helped judge projects and shared expertise with students. This semester, 30 students from Baltimore Polytechnic Institute came and had an opportunity to engage with students, learn about the projects and get a closer look at the design process. FIRST Place: Team Toilet Tilter (Steven Gunter, Justin Layton, Tae Lee, Gary Mckee, Lucas Myers and Ryan Nguyen) with their project "Toilet Seat Tilter"
SECOND place: Team Wheels of an Average Temperature (Austin Baldridge, Christine Bersabal, Eli Griff-McMahon, Elias Gunter, Michael Houser and Delia Shin) with their project "Cooling And Responding seat (CARseat)"
THIRD place: Team Chill Dudes (Christian Germeille, Ellery Klein, Daniel Lass, Alexei Marqueen, Myuran Seharaseyoon and Chungho Woo) with their project "Spin & Chill"
The Department of Mechanical Engineering held the Spring Design Day on May 5, 2016 from 11 a.m. to 2 p.m. in the Kim Engineering Building. 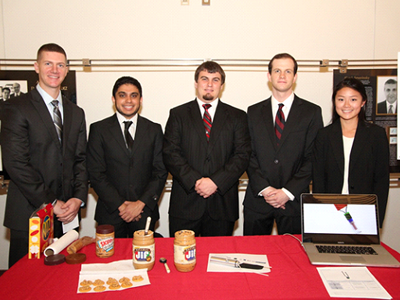 This semester, Design Day showcased 30 student teams, all featuring original product prototype designs. A wide range of exhibits including everything from an automated pill dispenser with online scheduling to a robot that grinds up and ejects built up debris in gutters. Bell Helicopter was the sponsor of the day's festivities. 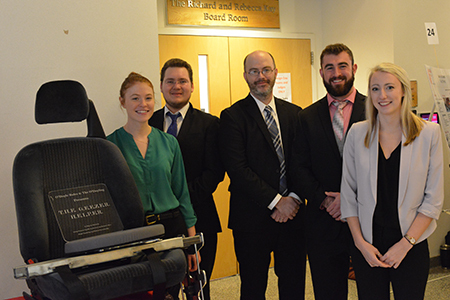 Bell Helicopter employee and Mechanical Engineering Visiting Committee chair Charley Kilmain (B.S. ’85) was on hand to judge teams and share his expertise with the students. View more photos from Design Day Spring 2016. An autonomous lake-skimming robot that improves water quality by managing harmful vegetation like algae and duckweed. A unique chair that helps elderly and disabled persons stay independent by making it easy to get in and out of a bathtub. An integrated baby travel solution that encompasses carrying, sleeping, and storage capabilities. In case you missed out on the action, photos from the event can be found here. 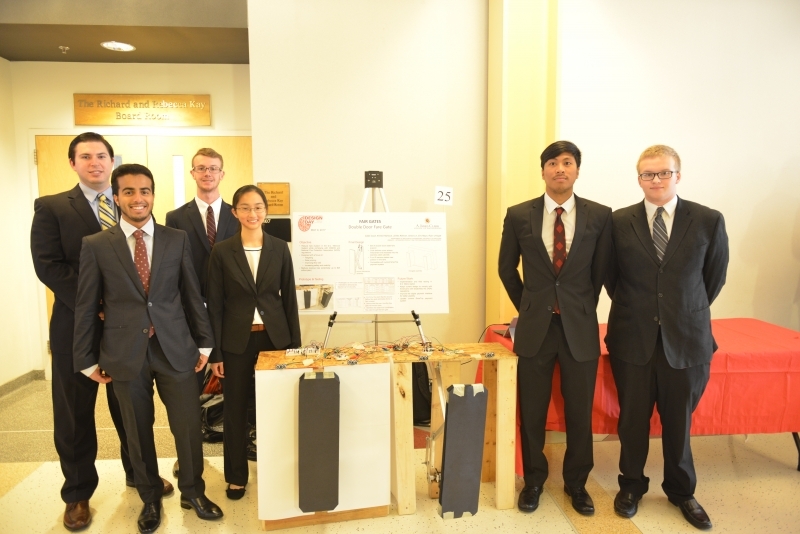 The Department of Mechanical Engineering held the Fall Design Day on December 8, 2015 from 11 a.m. to 2 p.m. in the Kim Engineering Building. 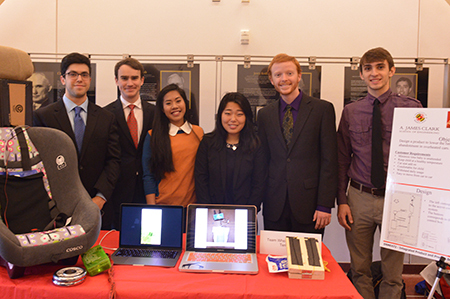 This semester, Design Day showcased 29 student teams, all featuring original product prototype designs. A wide range of exhibits including everything from a device that simulates a horse's walking motion for therapy applications and a hands-free sheet music turner to a window that can open and close automatically depending on temperature differentials and an automated tennis racquetwrapper. Sponsors Intralox and Boeing helped the support the day's festivities, while Intralox employees Andy Akers and Matthew Fourney were on hand to judge teams and share their expertise with the students. View more photos from Design Day Spring 2015. A versatile, easy to assemble incident screen to be used by first responders at major highway accidents. Robotic travel mug washer: Clean your mug while you wait in line at the coffee shop. An automated device that provides a customized grip tape wrap for a variety of sports sticks i.e. tennis racket, lacrosse stick, etc. The R.M.E.R.D. delivers and dispenses medical devices to those suffering from reaction-based medical emergencies. 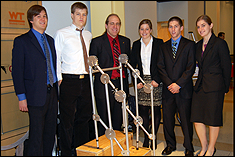 The Department of Mechanical Engineering Spring Design Day held May 6, 2015 from 11 a.m. to 2 p.m. in the Kim Engineering Building Rotunda. 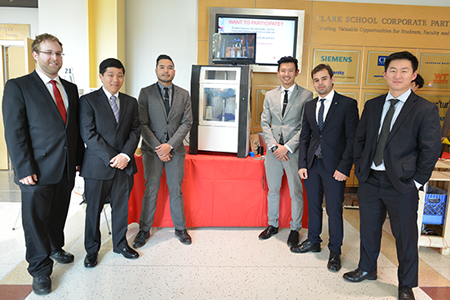 Design Day highlighted the talents and creativity of mechanical engineering students in the Integrated Product and Process Development Course. 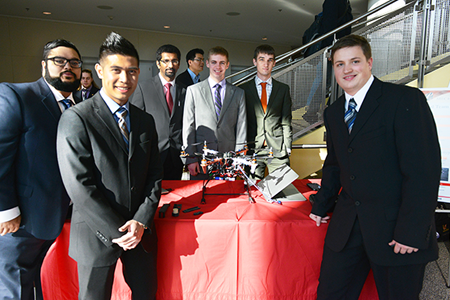 27 teams of seniors presented project prototypes built to solve selected engineering problems, with the top voted team receiving the "People's Choice Award." Design Day Spring 2015 was sponsored by Bell Helicopter who provided a Texas-style BBQ food truck, and a recruiter booth where students could learn about future career opportunities. The Spot Buddy is an automatic weight lifting spotting machine that senses a user's distress during an exercise. 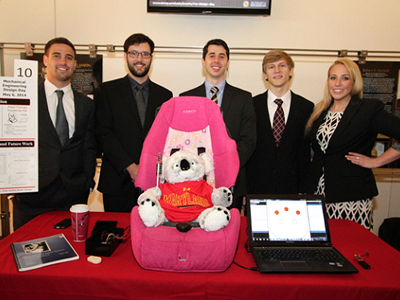 A portable pad placed on a child seat that notifies the user to remember the child or if temperature conditions become unsafe. Recycled Asphalt Shingles (RAS), re-purposed for fuel needs. A screwdriver with a planetary gear system that increases rotational speed of one shaft and torque of the other shaft. The Scoop 'n' Spread eliminates the messy nature of retrieving the small remaining contents of a jar. Bio-inspired, loft wing design that sustainably creates a natural cooling breeze.